First of all thank you! The response I’ve had to my work during 2016 has been astonishing. While it’s important to find your own voice in creativity and follow your own ideas, I like to know that I am connecting with people. This year’s review is different. I have made many more machinima (videos) (on Vimeo) this year, and a lot fewer photographs (on Flickr). My first choice is the machinima that was shown on the outdoor screen in Denver’s theatre district during September having been selected for Supernova Festival. In fact it’s showing in the background of this video at 30 seconds in, just as Ivar Zeile of Supernova is saying “the next evolution of public art” – he is talking in general and about digital art. 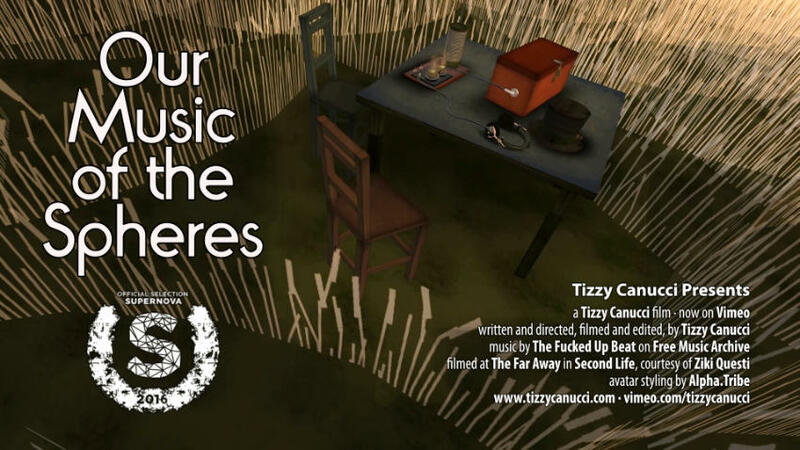 Our Music of the Spheres from Tizzy Canucci on Vimeo. Filmed at The Far Away. In second place, I have chosen the first machinima I made this year. It is the most played and the one with the most ‘finishes’. The Constant Falling was something of a turning point for me, where machinima moved from being an interesting experiment to my main form of expression. The Constant Falling from Tizzy Canucci on Vimeo. Filmed at the highly atmospheric Furillen. The third choice is more difficult, between several machinima coming out of SaveMe Oh performances. The Colouring of Snow has the third most plays and Symphony for a Lost King has the second most likes, but He’s Watching You has the most likes, so that’s the one. He’s Watching You from Tizzy Canucci on Vimeo. Lastly, I’ve chosen There is No Cure for Curiosity, which was popular in plays, finishes and likes. Insilico was seemingly doomed to close, but it is still all there (excepting the shopping places) as of 23rd December. I also wrote a blog post about making it and the issues involved. There is No Cure for Curiosity from Tizzy Canucci on Vimeo. Filmed at Insilico. In previous years, I’ve visited more sims talking photographs. In 2016 I was more selective. I’ve never chased popularity, but this year I restricted myself more to putting up what I liked as an image. Many of the images were extracted from machinima this year, and many of those were abstract. Colour and abstraction have always attracted me – the point where art (or music too) breaks down from something to nothing. However, what gets the most response is scenery – a kind of gentle romanticism with a dash of nostalgia. The Hell’s Haven. My images of Hell’s Haven were the most popular, and the sim was recently reincarnated as Hell’s Heaven 2.0. I never tire of Chouchou, and it is a different experience on every visit. No post-processing of the image, apart from image stitching and a little sharpening. There are two panoramas in this year’s list, both of which I really like. I don’t think the extra few degrees to 360 would have added anything. Frame from The Colouring of Snow, a machinima made at the Saveme Oh performance at Furillen on 6 Feb 2016. ← Gender swapping – comfortable in your virtual body?